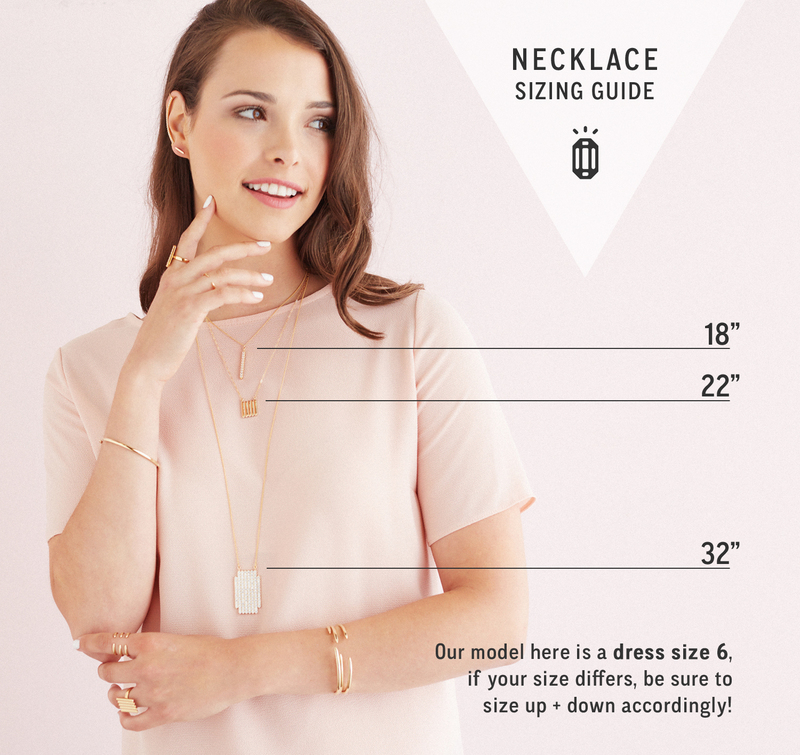 Read the blog post about the necklace sizing here! Domestic orders over $75 will ship for free! Items shipped for free will be sent with USPS Priority mail. For all orders, we use USPS Priority and Express shipping for both domestic and international orders. All packages have both Delivery Confirmation and tracking information. Shipping costs are based on the weight of the item, the destination, and the method of shipment. Please allow up to 3-4 business days for processing. You will receive an email when your order is shipped that will contain tracking information. For all domestic orders, insurance is applied to your shipment with no additional cost to you. If for any reason you are not, please contact us via email (orders@prismeradesign.com) for specific instructions on how to send your item back. For our security, packages that arrive without prior contact will not be accepted. Items must be unused, unaltered, unworn, and in their original packaging. Please insure your return package; we are not responsible for lost or damaged returns. To make an exchange, items must be returned within 30 days of shipment date. Store credits are issued in full. You may use your store credit to purchase anything in our online shop! If you would prefer a refund, you must request it within 5 days of receipt and the item must be shipped back within 14 days. After that time, all requests will be considered for store credit. Refunds are applied to the original method of payment and exclude shipping costs. Antique/vintage pieces are subject to a 15% restocking fee. Custom and special orders are final sale and not refundable. Discounted items are also final sale unless otherwise noted. Credits and refunds will be issued within 2 weeks, after we have received and reviewed the returned items. Please do not hesitate to contact us about any questions regarding returns. Your order will be shipped based on the item with the longest lead time. For example, if you order 3 in stock items but 1 piece that is made to order, your entire order will ship based on the timeline of the piece that is made to order. If you would like your order to be shipped as ready, please make a note of it in the comments section and an additional shipping fee will be charged to your total. We currently accept Mastercard, Visa, Discover, American Express and Paypal. Orders using credit card payment will be charged when your order is ready to ship. We will only adjust prices purchased at full price, at a maximum of 7 days prior to the date of request. Thank you for understanding! It can be tough to shop online. If you have any questions, please don't hesitate to contact me- I'm just an email away. You can reach me at Laura@prismeradesign.com. All correspondence is important to me and I do my very best to reply within a day. If it's urgent, please put the word URGENT in the subject line and your email will be prioritized for response. Prismera Design will not share any of your personal information. We do not gather any information about you when you visit this website unless you choose to provide the information to us. If you sign up for our newsletter, you will receive e-mails from us announcing new products, events, or updates to our website. This website is a safe and secure place. Our overall policy is mutual consideration and understanding. A custom order includes changing color schemes or materials of existing designs or having a unique piece designed just for you. The lead time for custom designs vary, depending on the availability of materials and the complexity of the piece. Please email us to request a time and pricing estimate. 50% of the total price of your custom made item is required before beginning the project; this deposit is non refundable in the event of cancellation. The remaining amount is required upon approval of the final design. If the item is no longer in the online store, you may request the item as a custom order. If an item is damaged, repairs are free of charge within 30 days of purchase. After 30 days, there is a minimum charge of $15, depending on the item, plus shipping costs. If you've lost an earring, please email us if you'd like to purchase a replacement. You will need to send us the remaining earring for matching. Jewelry orders are usually shipped in a black gift box and/or in a velvet pouch, tied with satin ribbon. If the order is a gift, please indicate that during checkout and the invoice will be withheld from the order. You may also include a short gift message to be included in the package. Gift wrap is available for purchase to make the shipment extra special! Gift certificates are available for purchase. The amount is up to you! Recipients of gift certificates will receive an email containing a code that they can use to redeem the gift. Gift certificates can only be redeemed at this website, PrismeraDesign.com.